Today is an historic day for Ireland. Northern Ireland's people have voted for a new political settlement. Its been a long and difficult journey to this point. Between 1969 and 1994 over 3,200 people died. Today was about recognising the difficulties our shared past and the hopes for our future. Ireland both North and South need to work to ensure that an Ireland of the 21st Century recognises and respects each of its citizens. The past was about bombs, bullets and hatred. The future is about Healthcare, Education, Reform of Public Services, housing for the youth of tomorrow, poverty and all the mundane business which belongs to government. 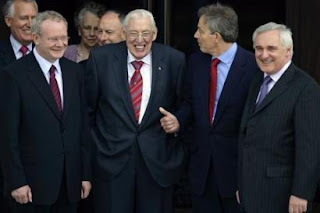 I wish Rt Hon Dr Paisley MP MLA and Mr McGuinness MLA best wishes for the future. The days ahead will require cool heads and tough hearts. More money for one sector means less for someone else.